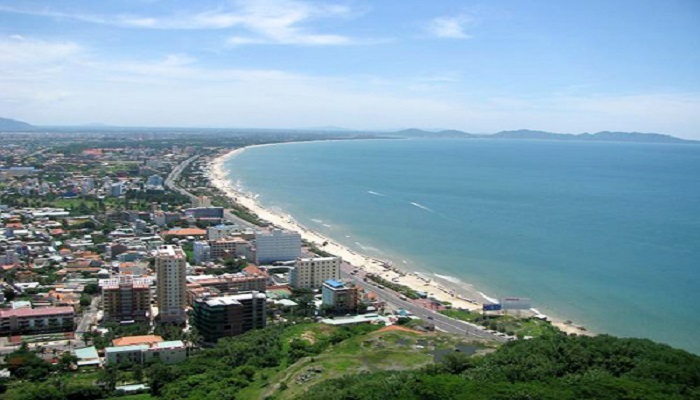 Ba Ria Vung Tau is well known with the beach city named Vung Tau City. This is the famous destination of the South East of the country. There are the several hundred thousand of visitors who come to Vung Tau city for their beach holiday each year. Ba Ria Vung Tau is bordered with Ho Chi Minh City to the west, with Dong Nai Province to the north, with Binh Thuan Province to the east and with the East Sea to the south. Center city: Vung Tau City. City and Districts: Ba Ria City, Long Dien District, Dat Do district, Chau Duc District, Tan Thanh District, Con Dao District and Xuyen Moc District. Tourist places: Vung Tau City, Long Dien District, Xuyen Moc District and Con Dao District. Climate: Ba Ria Vung Tau Province is in the tropical monsoon climate region. There are the rain season from May to October and the dry time from November to April. The average temperature is 27 C degree. The time for travelling in this province is round of the year. Transportation: Travel conveniently by land and sea to the province and from it to other provinces. Population: There are the main groups who live together such as Kinh, Hoa, Chơ Ro, Khmer and some other ethnic groups. Niet Ban Tinh Xa Pagoda (also called the Reclining Buddha Pagoda): The construction of Niet Ban Tinh Xa was built in 1969 and completed in 1974. The pagoda faces the sea on the western side of Small (Nho) Mountain and houses a 12m long statue of a reclining Buddha made of reinforced concrete and covered with marble (from the Marble Mountains in Da Nang). Especially, Niet Ban Tinh Xa is famous for its 5,000 kg bronze bell. Giant Jesus: Located on Nho Mountain (Small Mountain), the enormous 28m high statue of Jesus looking towards the East Sea with outspreading arms was built in 1971. The interior of the statue is hollow and contains a spiral staircase of 129 steps, ascending from the foot of the statue to its neck. The two shoulders of the statue are balconies, each of which is able to accommodate up to six people, standing to enjoy a splendid view of the surrounding landscape. Than Tam Thang Temple: was built in the reign of Minh Mang King (1820-1840), the temple was built to commemorate three genies (Pham Van Dinh, Le Van Loc and Ngo Van Huyen) who founded the three Thang villages in Vung Tau. At first, the temple was just a thatched cottage, but in 1965, it was rebuilt like its current appearance. The temple was designed in a connecting architectural structure. After a three-door gate, there is a row of four houses, a meeting hall, Vo Ca stage, where classical drama performances take place in festivals etc. Bach Dinh (White Palace): The construction of Bach Dinh was built in 1898 and completed in 1916. The villa was used as a rest house for French Governor Paul Doumer. The villa’s architecture was designed according to late 19th century French architecture and its facade was decorated with ancient Greek Saint Images. Nowadays, Bach Dinh is one of attractive sites in Vung Tau to visit. Vung Tau Lighthouse: Built in 1907, Vung Tau Lighthouse is located at an altitude of 170m, on the Peak of Small Mountain. The lighthouse is 18m high and 3m wide. It can light as far as 35 miles and contains a telescope to observe and direct boats and ships. From the lighthouse, we can enjoy a view of Vung Tau as far as Ba Ria and Can Gio. Thuy Van Beach: located on the southeast of Vung Tau City, Thuy Van Beach is a beautiful and large beach. Visiting to the beach, we can see many accommodations and services in the area with a various systems of restaurants, holds, parking areas as well as lifeguards patrolling the beach. Thuy Van Beach is the most crowded beach in Vung Tau. Front Beach (Bai Truoc): Front Beach is located in the centre of Vung Tau, along Quang Trung Street, where there are numerous luxurious hotels: Palace, Rex, Hong River, Huong River, Royal etc. From Front Beach, via Ha Long Street through Pineapple Beach (Bai Dua), we can reach Thuy Van Beach. Dinh Co: Located in Long Hai town, Long Dat district, Dinh Co is one of the most popular tourist sites in Vung Tau. According to legend, Dinh Co was built in the late 18th century and dedicated to the virgin Le Thi Hong who lived a sequestrated life and who accidentally died in the sea. Her body was carried by the waves, and drifted ashore on Hang Island, where villagers buried her on a hillock on the coast. Because her spirit kept appearing to the local people to predict events and cure them of diseases, the villagers set up a shrine in her honor. Binh Chau hot spring: located 70km west of Vung Tau, Binh Chau hot spring or Binh Chau Thermal Springs consists of lakes and ponds by an underground pool of mineral water that has been created from a network of 70 main sources. The hot water has the different degrees of heat up to the depth of water level such as 840C or 640C or 400C. With 400C temperature, the hot water is directed into pools where people can steep in their feet and hands for its medicinal values, such as treating skin disease and rheumatism. Binh Chau Thermal Springs is located in a protected area surrounded by luxuriant forests and lakes. It is an attractive site for tourists to visit for both health and recreational purpose. Con Dao Island: or Con Son Archipelago including 14 various islands are located in the southeast sea. With the pleasant coastal climate, the average annual temperature is 26.90C. The coastline is 200km long and has many beautiful sunny beaches. Especially, Con Dao Island has a national forest, beautiful beaches and precious marine products. Con Dao Island is a famous place because it used to host a convict prison during the French colonial time; therefore, Con Dao Prison existed from 1862 to 1975 (114 years). Furthermore, there are more than 20,000 graves of the revolutionary soldiers in Hang Duong Cemetery. Long Hai Beach: located 30km northeast of Vung Tau City, Long Hai Beach is a beautiful beach spreading along the Chau Long and Chau Vien Mountains. Along the coast, there are several kilometers of orchards; therefore, the scenery is fantastic. This beach is a favorite place for tourists who enjoy the quietness on the vacations. Suoi Tien (Fairy Stream): located 7km northwest of Ba Ria Town, Tan Than District, both Suoi Tien (Fairy Stream) and Suoi Da (Rocky Stream) originate in Dinh Mountain. Along the banks of Fairy Stream, there are many cliffs, some of which are 3 – 5 m high and very flat. According to legend, fairies would come here to bathe before returning to Heaven; therefore, it is called Fairy Stream. O Quan Beach (Nghinh Phong Beach): Nghinh Phong means, “Receiving the wind” in Vietnamese. Situated at the extreme south of Vung Tau, near Pineapple Beach, the beach is narrow and its water is transparent with continuous waves and wind. Furthermore, it is bordered by high rocky cliffs of Nghinh Phong Cape; therefore, it is also an exciting site for tourists who enjoy adventurous games. Dinh Co Festival (10th -12th of the 12th lunar month): Dinh Co is a monumental building situated near Long Hai seashore. Dinh Co was dedicated to a compassionate woman who lived a sequestered life and accidentally died in the sea. Every year, according to traditional rituals, Long Hai fishermen solemnly celebrate the Dinh Co Festival in three days. Village notables dressed in formal apparel conduct the ceremony to pray for favorable weather, wealth and peace. Thang Genies Festival: (17th -20th of the 2nd lunar month) Thang Tam Communal House is dedicated to the three Genies who founded the three Thang villages in Vung Tau. The festival marks the end of one fishing season and the beginning of the next. The ceremony consists of praying, making offerings to the three Genies and burning incense. Then, people hold various forms of entertainment and games, such as lion dance and classical drama. This festival included folk culture is a typical activity of fishermen in Vung Tau. And there are many other unique festivals in the province. There are different local specialties in the province such as Mắm Ruốc Trí Hải (Trí Hải shrimp paste), Thịt Nướng Kiểu Nga (Kiều Nga roast), Rượu Áp Xanh (Ap Xanh alcohol), Bánh Canh Long Hương (Long Hương rice spaghetti), Bánh Hỏi An Nhất (An Nhất fine rice vermicelli), Bánh Khọt (fried rice cake), Tiết Canh Tôm (shrimps’ blood curds) and other typical specialties.